A 3 1/2-year-old boy playing with a stove in a first-floor apartment in the Bronx appears to have sparked New York City's deadliest residential fire in decades, a blaze that spread through every floor of the building within a matter of minutes, killing 12 people, including an 8-month-old baby, city officials said Friday. Erica Byfield reports. A 3-year-old boy playing with a stove in a first-floor apartment near the Bronx Zoo appears to have sparked New York City's deadliest residential fire in decades, a blaze that spread through every floor of the building within a matter of minutes, killing 12 people, including an 8-month-old baby, city officials said Friday. 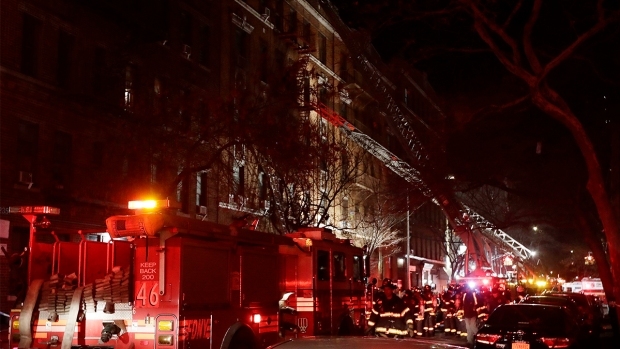 The child was turning burners in his kitchen in the five-story building on Prospect Avenue and East 187th Street and ignited the flames, FDNY Commissioner Daniel Nigro said. The boy's mother, who was in the apartment but not with the child at the time, was alerted to the blaze by his screams and grabbed him, along with his 2-year-old sister and fled their home. They left the door open, Nigro said, which allowed the blaze to rapidly spread up the stairs. A city spokesman said the building was supposed to have fire-rated, self-closing doors; it was not clear if one was installed or, if so, why it didn't close behind them. "The stairway acted like a chimney," Nigro said. "It took the fire so quickly up the stairs that people had very little time to react, they couldn't get back down the stairs -- those that tried, a few of them perished." The death toll started at six but had risen to 12 by Thursday night, hours after the blaze was contained. Mayor Bill de Blasio had cautioned there could be additional casualties, as four critically injured people were continuing to fight for their lives Friday morning. Others had less severe injuries. The dozen who died include three girls, ages 8 months, 2 and 7, an unidentified boy, another child, three women and four other adults, according to fire officials. Officials and relatives have identified five of the victims: 2- and 7-year-old girls named Kylie and Charmela Francis, and their mother, 37-year-old Karen Francis; 19-year-old Shantay Young; and 58-year-old Maria Batiz. A relative at the scene shared photos with News 4 of the children, one just a wide-eyed toddler sipping from a bottle, the other a young girl with a black leather jacket and hot pink pants. Five of the victims were pronounced dead at the scene, police say: a 1-year-old girl, a 63-year-old woman, and three unidentified men. 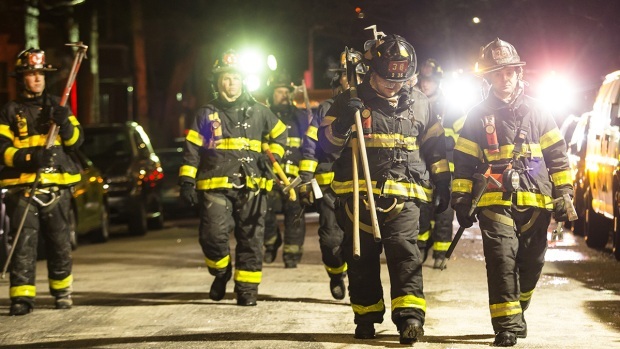 De Blasio called the Thursday night inferno an "unspeakable tragedy." "This is the worst fire tragedy we have seen in this city in at least a quarter-century," he said at a news briefing. "Based on the information we have now, this will rank as one of the worst losses of life in many, many years." Nigro said the little boy who sparked the blaze had a history of playing with stove burners. He said the kitchen exploded into flames so quickly the mother had little time to do anything other than grab her children and leave. The FDNY responded within minutes, with 170 firefighters, and quickly knocked out the blaze, but 12 lives were lost. Except for the Sept. 11 terror attacks, it was the city's deadliest fire since 87 people were killed at a social club fire in the Bronx in 1990. 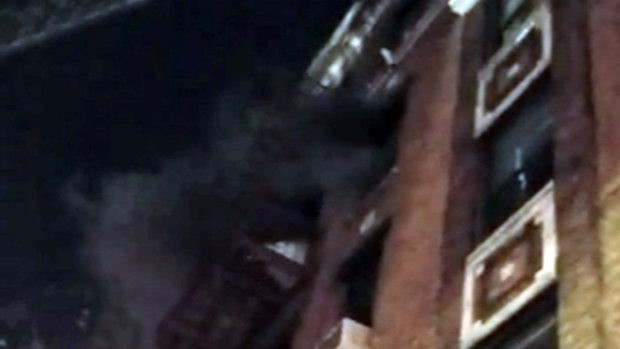 Cellphone footage from the site of the fatal blaze at an apartment building near the Bronx Zoo shows smoke pouring from a third-story window. Those who were hurt were taken to St. Barnabas Hospital and Jacobi Medical Center. The dozens who escaped the flames were being sheltered by the Red Cross at a school about a block away on Thursday, according to officials. There are 25 units in the apartment building. It wasn't clear when residents would be allowed back in. Nigro said searches had been completed and everyone was accounted for. "Children starting fires is not rare," Nigro added. "The department has a program to educate children and we get 75 to 100 referrals a year about children that have issues with playing with fire or being fascinated with fire so it's not particularly unusual but very sad." 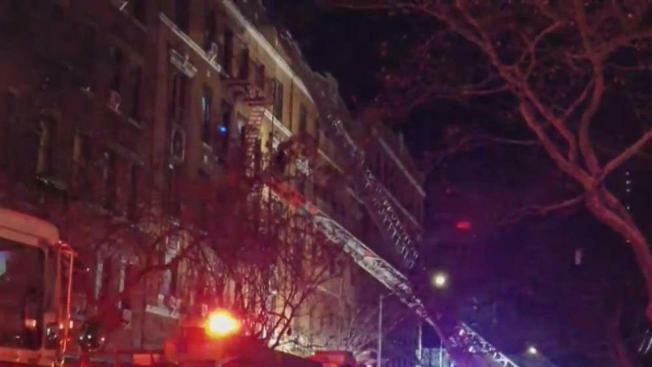 Witnesses at the scene of a deadly fire at an apartment building near the Bronx Zoo describe children with bare feet trying to escape the flames. Michael George reports. The fire is the third three-alarm blaze or greater in the borough in a day and half. On Wednesday morning, a fire ripped through a multistory home on Garden Street near the Bronx Zoo that forced residents to quickly flee, some still in bathrobes. That same morning, a second fire burned at another multistory apartment building on Knox Place in the Norwood section. No serious injuries were reported in either of those cases. The NYPD, FDNY, city Office of Emergency Managment, Bronx Borough President's Office and Mayor's Office are conducting a cloathing and coat drive for those affected by the fire at Church of Saint Martin of Tours on Crotona Avenue from 9 a.m. to 4 p.m. on Saturday and Sunday.